Will You Be Getting Your Post From One Of These Royal Mail E-Trikes? Will Noble Will You Be Getting Your Post From One Of These Royal Mail E-Trikes? Royal Mail has been airing its new e-trikes in Stratford. Powered by a combination of solar, pedal, brake and battery, eight of the zero-carbon vehicles are being trialled from the end of March, in Stratford, east London — as well as in Cambridge and Sutton Coldfield. 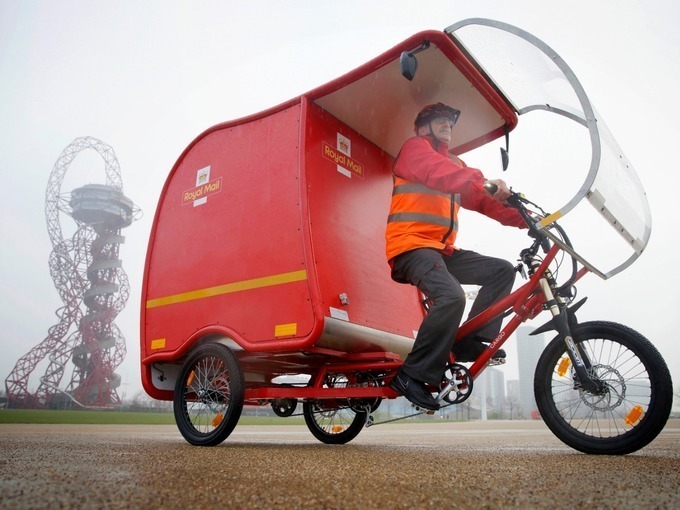 The trikes — aimed to boost Royal Mail's green credentials, and supported by TfL — will be tested out for around six months, before a decision is made on whether to expand the fleet. I'm delighted that Royal Mail is trialling e-trikes which will take polluting vehicles off our streets — helping to reduce congestion and clean up London's toxic air. These vehicles are the first-of a-kind for Royal Mail, which has been using motorised vehicles for over 120 years. Over its 500 year history, the company has used numerous modes of transport, including horse and cart, and steam engines. At least the e-trikes should prove popular with posties themselves, given that they're fitted with much-needed rain shields (see press images).